ENCOUNTER THE BEST OF TURKEY – 10 day / 9 night tour – This tour takes you on a breathtaking adventure through many of the famous and historic locations in this beautiful country. Your journey starts in the bustling metropolis of Istanbul, where you will have the opportunity to explore famous pieces of Ottoman architecture, sail along the sparkling blue waters of the Bosphorus, and wander through spice markets full of exotic sights, tastes and smells. Our tour then makes it’s way to the famous and unique landscape of Cappadocia, where you will spend several days taking in the incredible rock formations and witnessing famous landmarks such as the underground cities and the local villages where the residents still live in rock-cut dwellings. 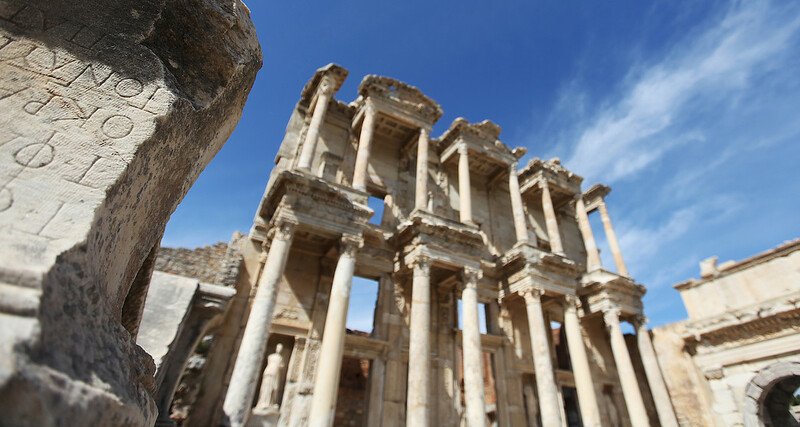 Lastly, you will encounter the famous ancient city of Ephesus and explore it’s wonders. This tour allows you to enjoy the beautiful sites and encounter the culture of this historic land, all with the comfort and knowledge that come from being in the good hands of our experienced guides. Upon your arrival in the Istanbul airport, someone will be there with a sign to pick you up after you gather your bags. You will have a driver that will take you to your hotel in Sultanahmet, the historical district of Istanbul. For the evening there are two optional programs that you can attend. The first option is a Whirling Dervish Ceremony at 7:30 for one hour (not operated on Tuesdays and Thursdays). The second option is a Turkish Cooking Class. In a small group you will prepare a delicious menu of Ottoman specialties. Classes start at 10:30am or 5:30pm and go for about 4 hours. (offered on Tuesdays, Wednesdays and Saturdays). 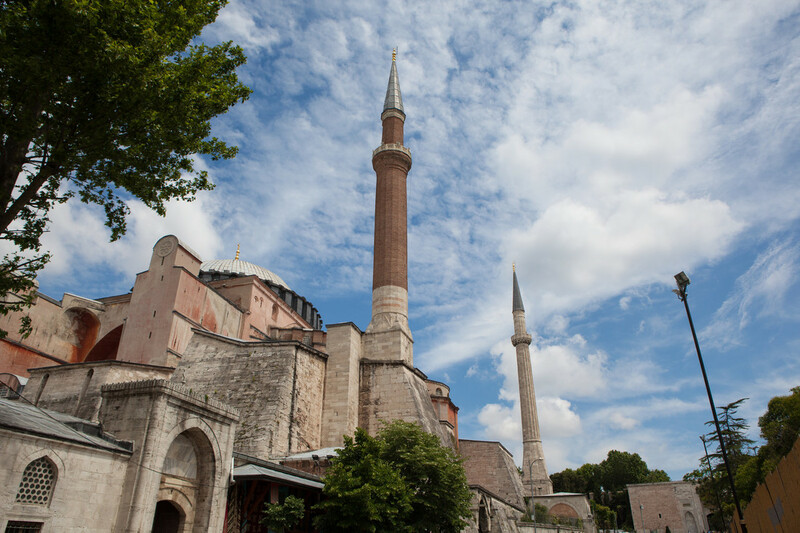 You will be picked up from the hotel to visit Emperor Justinians masterpiece, the Hagia Sophia. Afterwards you will walk to its counterpart, the Blue Mosque, with its intriguing blue Iznik tiled interior. A short jaunt past the Hippodrome and its monuments will be followed by a visit to the Grand Bazaar. Following an included lunch, you will continue your tour by visiting the home of the Ottoman Sultan, Topkapi Palace, with a chance to see its Imperial treasury and its incredible location on a hill overlooking all of Istanbul. Afterwards you’ll head to the Basilica Cistern, an underground water cistern, which is a beautiful piece of Byzantine engineering. You will return to the hotel for some time to relax after the tour. You will be picked up from the hotel around 8:30 a.m for your Bosphorus Boat Tour. First, you will visit Rustem Pasa Mosque, special with its Ottoman tiles. 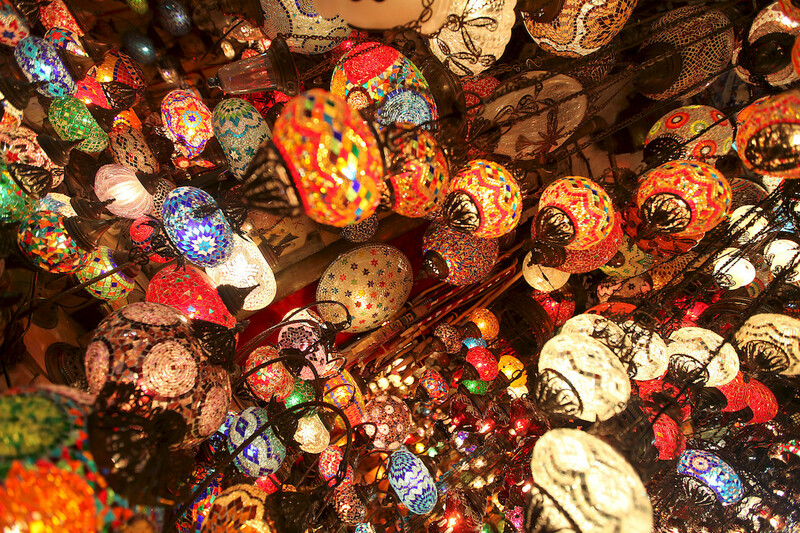 Then, you will walk through the Egyptian Bazaar (Spice Market), which was built in 1664 and is filled with the fragrances of the exotic East, such as spices, dried fruits, and Turkish delights. This is followed by your Bosphorus boat tour, which takes about 1.5 hours. You will see the most impressive sights along the shores of the Bosphorus, including: Dolmabahce Palace, Ciragan Palace, Maiden’s Tower, Bosphorus bridges, Rumeli and Anadolu fortresses, and Ottoman Residences. After your day of experiencing Istanbul at a different pace, you will return to your hotel. You will have free time to do some shopping or take in a Turkish Bath this afternoon. You will be picked up from the hotel around 8:30am for your tour. The first stop is the Yedikule Dungeons located within the city walls of Constantinople, once used as a prison and execution site for the young princes. Your drive along the city walls will end at one of the oldest and most important churches in the city, the Church of Chora, representing fascinating wall paintings which tell the life of Christ in an historical order. Even though the building itself is small, the meaning was great for Byzantines, being founded at the borders of the city and welcoming the visitors. Today the environment is restored and this is a good place to spend time with local artisans and explore the wooden houses. Next, you will have a tea-coffee break at one of the most splendid spots of Istanbul, Pierre Loti Hill, with a beautiful view over the Golden Horn. This location inspired the French Poet ,Mr Pierre Loti, who gave the spot his name. You will again continue driving, but this time along the shores of the beautiful Golden Horn and through the towns of Fener and Balat, which are the old Greek and Jewish living sites. Fener Orthodox Patriarchate is also located in the area where you will stop for the visit. You will return to the hotel for some time to relax after the tour. This morning you will be transported to the airport where you will catch your flight to Kayseri. Upon your arrival at the Kayseri airport, you will be picked up and brought to your charming hotel in Cappadocia. The trekking tour is a half-day activity from sunset point (Kizilcukur) to Cavusin, through the Rose Valley. This valley holds different colors and incredible types of rock formations. Visit the churches of Uzumlu and St. Nicholas and finish the hike in Cavusin Village, where the people still live in rock-cut dwellings and stone houses. 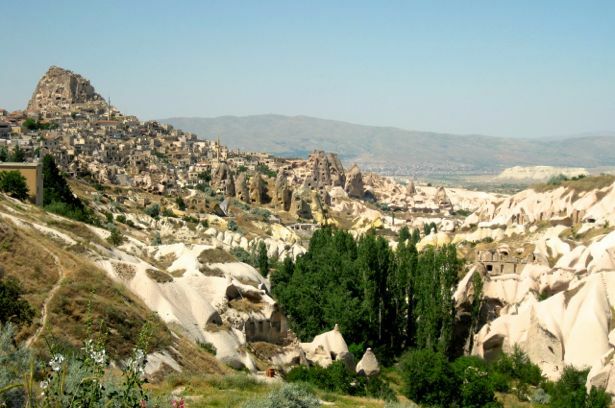 It takes about 3 – 4 hours and the path meanders through one of the most interesting valleys of Cappadocia. Cappadocia means ‘land of beautiful horses’. One of the best ways to experience the beauty of Cappadocia region is on horseback. We invite you to discover the magic of Cappadocia from the back of a horse. One hour: Ride along the banks of the sparkling Kizilirmak River. Two hours: Ride up Ziyaret Mountain for a beautiful view and a visit to a refreshing natural spring. Today you will fly to Izmir, where you will be picked up and transported to your hotel in Kusadasi. After seeing these highlights of Turkey, we will bring you to the airport for your trip back home. You will have many stories and great pictures to bring back and share with your friends. *Istanbul and Cappadocia day tours are semi-private (meaning you join a group of 5-15 others). 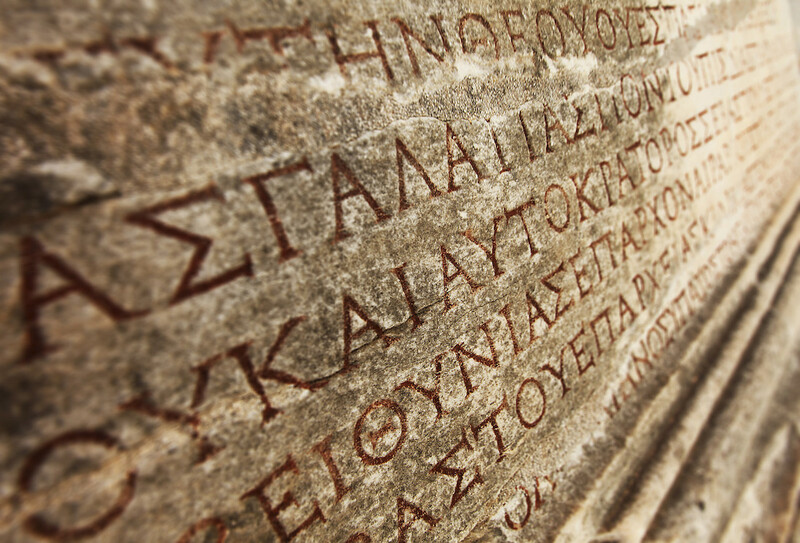 Ephesus tours are exclusively private. As this tour is available year round please bring clothing suitable to your season. Some of the best ways to experience this ancient history is to walk in the footsteps of those that came before so be prepared for some walking.